1. What kind of a goal did you actually set? In the three posts about this I gave you three types of goals, a Screw It All Up Goal, a Realistic Goal, and a Stretch Goal. When you look at your one goal, where does it actually fit? Is it actually too big of a goal and it belongs in the Screw It All Up category? Or is it more of a Realistic Goal and you could actually go for a Stretch Goal? 2. Did you actually print out the worksheet? Why or why not? If you work through the process of writing out a goal and you put it somewhere where you'll see it often, then the likelihood of achieving that goal is significantly higher. If you royally screwed up your German learning already this year, then I suggest you get back on track by printing out the worksheet and working your little way through it. And in fact, consider this the beginning of your year! Why not? Click here to download your bonus worksheet! 3. 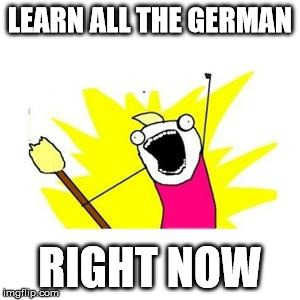 Are you still trying to learn all the German RIGHT NOW? Stop, just stop. Learn just a little bit of German RIGHT NOW. Just a little bit. ...or are you simply way, way off track? It's OK. Maybe you had the right goal, but things have changed now, whether it's your work schedule, your personal life, or maybe you had another life change. Set a new goal! Change it! Do it! 4. Wanna share the madness your goal? There is a *lot* happening the rest of this month (blog posts, a give away and more!) and I highly encourage you to sign up for the Learn German Online with Nicole Newsletter. Scroll down and check it out!